This collection of modern sofas dares to create a unique look with simple and minimalistic designs. Practical, comfortable and visually simple is how we can best define this modern sofa collection. These modern sofas feature sturdy construction with a wide array of fabrics including polyester, linen, chenille or Brussels Charcoal velvet in a spectrum of soothing to vibrant colors. 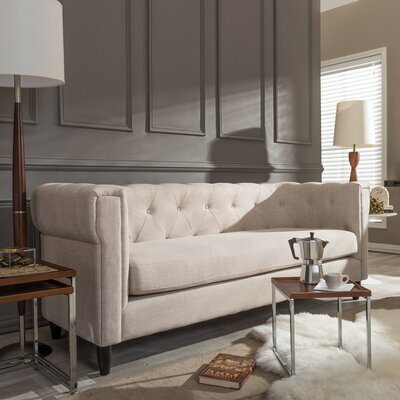 Tastefully designed Brayden Studio Verdi Tufted Sofa is ideal for contemporary style homes. 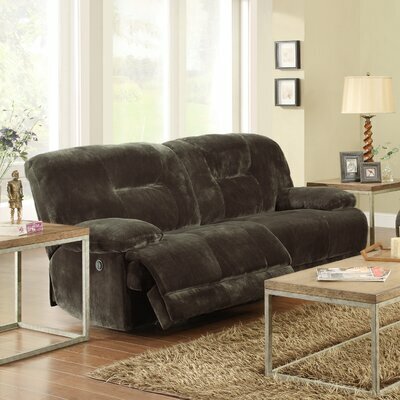 Adorned with button tufts on warm charcoal colored upholstery, it creates a visual delight that is hard to miss. For ultimate comfort and long lasting durability, this elegant sofa features sturdy wooden frame, thick foam cushioning and soft chenille upholstery. Crafted to accommodate three people conveniently, the stylish sofa will be a great addition to your living room. Available in multiple color options, you can put it to use as soon as you receive it since it does not require any assemble. Soft chenille upholstery with solid print. Available in more fabric colors including Green, Light Cream and Spa Blue. One extra leg in center for additional support. Armen Living provides one year limited warranty. Give your living room an elegant touch with the clean and crisp look of Dorel Living Powell Two-Toned Sofa. This graceful sofa features clean lines, square silhouette with two cushion seat, track arms and solid wood feet in dark brown finish. It is upholstered in gorgeous graphite gray colored fabric which is accentuated with white welt trim detail to create a visually appealing combination. The patent-pending construction of Dorel Living Powell Sofa makes its delivery to your home fast and convenient. Spring core with lusciously foam filled cushions give immense relaxation when you rest on it. It is a perfect choice for your living room. Frame manufactured from sturdy wood and plywood. Upholstered in easy-to-care polyester fabric. Seat cushions feature spring core and thick foam padding for additional support. Cushions are removable but non-reversible. Block feet in brown finish. Patent pending construction for speedy and convenient home-delivery. Dorel Living provides one year limited warranty. Perfect for retro style home, the Kedzie Leather Sofa will add elegance and style to your living room. Manufactured from premium quality wood and materials, this sofa promises sturdiness and long lasting durability. Featuring bonded leather upholstery with tufted design, the Kedzie Leather Sofa flaunts a visually appealing style. It has track arms and darkwood finished cube shaped tapered feet that complement its overall look. For a wholesome look, you can top up this sofa with accent pillows. Bonded leather upholstery for chic and bold look. Also available in more fabric colors including Red and Cream. Seat cushions have pocket coils for firm support and comfort. Back cushions are accented with tufts. Stylish cube shaped tapered feet in dark wood finish. 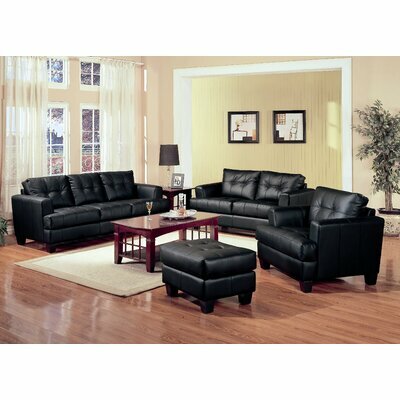 Gracefully fashioned Wholesale Interiors Cortland Sofa promises style and elegance to adorn your living room with. Beige colored linen upholstery accentuated with matching button tufts and tapered birch wood legs in black creates an eye-catching masterpiece. This gorgeous single cushion seat sofa conveniently accommodates three people. Comfortable and plush, the Cortland Sofa will be a valuable addition to your living room. Linen upholstery is very soft. Wholesale Interiors provide 30 days limited warranty for parts only. Class, style and comfort combine together to unveil a masterpiece furniture – the Global Furniture USA 88″ Sofa. Upholstered in Natalie black colored bonded leather, this sleek and contemporary sofa exudes an air of boldness and mesmerizing charm. Exquisitely designed, the 88″ Sofa by Global Furniture USA features movable headrests with wide and plush arms and chrome finished metal legs. 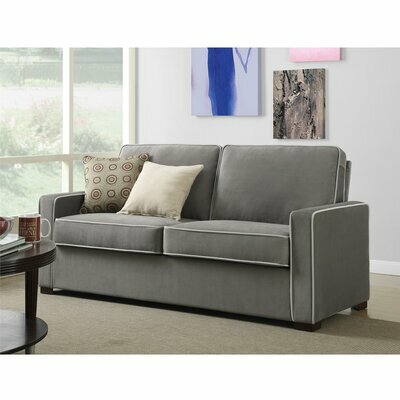 This multiple cushion seat sofa is spacious and very comfortable to plop on with your favorite book. Bring home this classy and cozy sofa to win praise from your friends and family. Also available in lovely Natalie Light Grey color. Pocking spring and foam filling for optimum comfort. Split back with adjustable headrests. Wide and plush square arms. Supported by stylish chrome finished legs. Global Furniture USA provides one year limited warranty. Awe your guests with luxurious and sophisticated look of Johannes Premium Damask Sofa by Hokku Designs. This classy and stylish modern sofa flaunts straight back and edgy lines with sleek track arms and dark brown, square shaped tapered feet. It showcases intricate design in premium damask upholstery which is further adorned with tufts. With no-sag springs at the core, this sofa with fully padded long seat cushion offers hours of comfort while the back offers soothing relief to your tired backs. Nail head trim detailing and two accent pillows accentuate its overall look. Built from hardwood for maximum durability. Upholstery fabric is a blend of 47% polyester and 53% rayon. Accentuated with tufts and silver nail head trim details. Straight back is very comfortable to lean on. Includes two matching accent pillows with beautiful print. Non-squeaking springs are coated with polytetrafluoroethylene. The pristine look of Jonathan Adler Lampert Sofa would be the focal point of your restful living room. It gathers all the elements of style and comfort to create an awe inspiring masterpiece. This stunning sofa boasts elegant shape, clean line and subtle shade. Result of skillful handcraftsmanship, the gorgeous Lampert Sofa reflects authenticity and praise worthy distinct look. It is upholstered in supreme quality Brussels Charcoal velvet with self welt for a sophisticated look that is synonymous to class and luxury. Blue colored fabric in Venice peacock finish beautifully complements the strong white base. This modern sofa comes with two matching bolster pillows for a peppier look. Pair it with comfortable matching chairs or ottoman to create a wholesome look. Place it in your entryway, living room or by the foot of your bed and enjoy a relaxing and comfortable evening. Brussels Charcoal with self welt. Includes two gorgeous bolster pillows. Soft and lovely velvet upholstery. Also available in appealing Grey color. Removable cushions allow easy cleaning. Legs and base in white finish. Bring style and comfort to any living room and brighten up its look with the sophisticated Cooper Sofa by TOV. 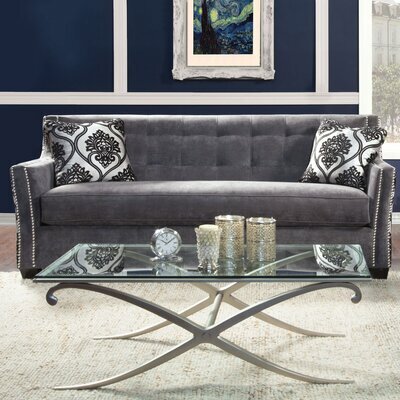 Studded with silver nail head trims, the gorgeous Cooper Sofa features modern take on classic comfort. Soft blue velvet is very soft to touch and pleasing to eyes. Matching bolster pillows and tapered legs complete the overall look with style and class. This stunning sofa will win you praise of your guests by creating a visual delight in your modern living room. Includes two bolster pillows in matching color. Over 1300 hand-applied nail head trim detailing accentuate the base and both arms. CA117 fire retardant polyurethane foam cushioning. Seat cushions can be removed easily for cleaning purpose. Includes one center leg for additional support and stability. An be utilized for both residential and commercial use. TOV provides one year limited product warranty. Please your gadget loving family with the Geoffrey Sofa by Woodbridge Home Designs. Soothe your tired legs and aching feet with the reclining footrests that make this sofa a must have in every home. This smartly designed sofa is further enhanced by plush textured chocolate microfiber cover. Combination of style, comfort and functionality, the one of a kind Geoffrey Sofa promises hours and hours of restful and relaxing evenings. Durable and robust wooden frame. Footrest sofa with reclining handles on both sides. Woodbridge Home Designs provides 90 days limited warranty. Product Care: Use dry cloth to wipe it clean; avoid using strong chemical cleaners. Futuristic design combined with nostalgic feel makes Whitaker Sofa a unique masterpiece. 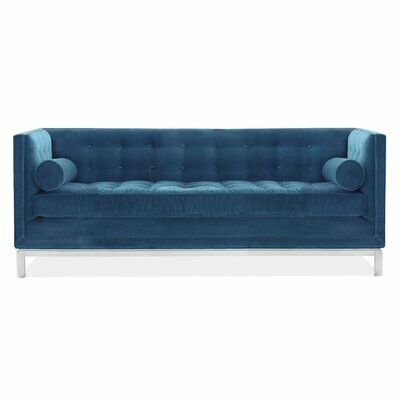 This elegantly proportioned sofa boasts a minimalistic yet chic style. 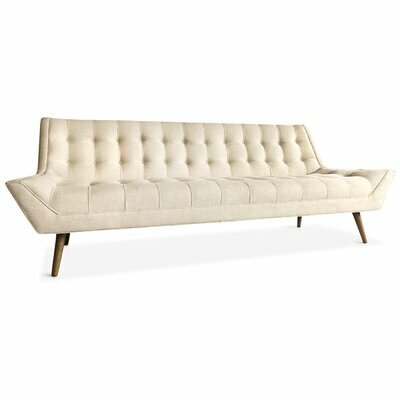 Its sculptural facets with button tufted back and wide seat generates an eye-catching sleek look. Helsinki smoke colored fabric and walnut finished tapered legs together add a feeling of California Ranch warmth. Manufactured from oak, birch and plywood. Also available in Ventura Sand color. Back is accented with button tufts. Slanting and tapered legs in walnut finish. Does not require any assembly.